"Aleutians" redirects here. For the people, see Aleuts. For other uses, see Aleutian (disambiguation). 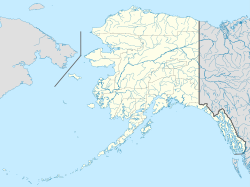 The Aleutian Islands (/əˈljuːʃən/; Russian: Алеутские острова; Aleut: Tanam Unangaa, literally "Land of the Aleuts", possibly from Chukchi aliat, "island"), also called the Aleut Islands or Aleutic Islands and known before 1867 as the Catherine Archipelago, are a chain of 14 large volcanic islands and 55 smaller ones belonging to both the U.S. state of Alaska and the Russian federal subject of Kamchatka Krai. They form part of the Aleutian Arc in the Northern Pacific Ocean, occupying an area of 6,821 sq mi (17,666 km2) and extending about 1,200 mi (1,900 km) westward from the Alaska Peninsula toward the Kamchatka Peninsula in Russia, and mark a dividing line between the Bering Sea to the north and the Pacific Ocean to the south. Crossing longitude 180°, at which point east and west longitude end, the archipelago contains both the westernmost part of the United States by longitude (Amatignak Island) and the easternmost by longitude (Semisopochnoi Island). The westernmost U.S. island in real terms, however, is Attu Island, west of which runs the International Date Line. While nearly all the archipelago is part of Alaska and is usually considered as being in the "Alaskan Bush", at the extreme western end, the small, geologically related Commander Islands belong to Russia. These Islands are most known for the battles and skirmishes that occurred there during the Aleutian Islands Campaign of World War II. Attu and Kiska were the only two foreign invasions of the United States during that war. Motion between the Kula Plate and the North American Plate along the margin of the Bering Shelf (in the Bering Sea north of the Aleutian arc) ended in the early Eocene. The Aleutian Basin, the ocean floor north of the Aleutian arc, is the remainder of the Kula Plate that got trapped when volcanism and subduction jumped south to its current location at c. 56 Ma. The Aleutian island arc, then, formed in the Early Eocene (55–50 Ma) when the subduction of the Pacific Plate under the North American Plate began. The arc is made of separate blocks that have been rotated clockwise. The basement underlying the islands is made of three stratigraphic units: an Eocene layer of volcanic rock, an Oligocene—Miocene layer of marine sedimentary rock, and a Pliocene—Quaternary layer of sedimentary and igneous rock. All five are located between 51° and 55° N latitude and 172° E and 163° W longitude. The largest islands in the Aleutians are Attu (the farthest from the mainland), and Unalaska, Umnak, and Unimak in the Fox Islands. The largest of those is Unimak Island, with an area of 1,571.41 mi2 (4,069.9 km2), followed by Unalaska Island, the only other Aleutian Island with an area over 1,000 square miles (2,600 km2). The axis of the archipelago near the mainland of Alaska has a southwest trend, but at Tanaga Island (about 178° W) its direction changes to the northwest. This change of direction corresponds to a curve in the line of volcanic fissures that have contributed their products to the building of the islands. Such curved chains are repeated about the Pacific Ocean in the Kuril Islands, the Japanese chain, and in the Philippines. 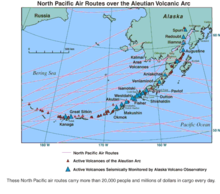 All these island arcs are at the edge of the Pacific Plate and experience much seismic activity, but are still habitable; the Aleutians lie between the Pacific and North American tectonic plates. The general elevation is greatest in the eastern islands and least in the western. The island chain is a western continuation of the Aleutian Range on the mainland. These volcanic islands reach heights of 6,200 feet (1,900 m). Makushin Volcano (5,691 feet (1,735 m)) located on Unalaska Island, is not quite visible from within the town of Unalaska, though the steam rising from its cone is visible on a (rare) clear day. Residents of Unalaska need only to climb one of the smaller hills in the area, such as Pyramid Peak or Mt. Newhall, to get a good look at the snow-covered cone. The volcanic Bogoslof and Fire Islands, which rose from the sea in 1796 and 1883 respectively, lie about 30 miles (50 km) west of Unalaska Bay. In 1906, a new volcanic cone rose between the islets of Bogoslof and Grewingk, near Unalaska, followed by another in 1907. These cones were nearly demolished by an explosive eruption on September 1, 1907. Newly found information in 2017, the volcanic cone erupted sending ash and ice particles 30,000 feet (9000 m) in the air. Image of the islands taken by the STS-56 crew. 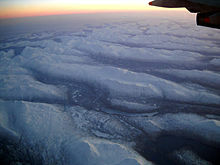 These cloud formations were seen over the western Aleutian Islands. ASTER image of the islands. Aleutian Islands on May 15, 2014, by NASA's Aqua satellite. The climate of the islands is oceanic, with moderate and fairly uniform temperatures and heavy rainfall. Fogs are almost constant. Summer weather is much cooler than Southeast Alaska (around Sitka), but the winter temperature of the islands and of the Alaska Panhandle is very nearly the same. According to the Köppen climate classification system, the area southwest of 53°30′N 167°00′W﻿ / ﻿53.5°N 167.0°W﻿ / 53.5; -167.0 on Unalaska Island have a "Subpolar Oceanic Climate" (type "Cfc" as are Reykjavík, Tórshavn, and the Auckland Islands), characterized by the coldest month averaging above 0 °C (32 °F), 1–3 months averaging above 10 °C (50 °F), and no significant precipitation difference between seasons. To the northeast of that point, the climate becomes "Subarctic With Cool Summers And Year Around Rainfall" (type "Dfc" as are Murmansk, St. Moritz, and Labrador City), where it is similar but colder, with the coldest month averaging below 0 °C (32 °F). During the winter the islands become the center for a semi-permanent low-pressure area called the Aleutian Low. The mean annual temperature for Unalaska, the most populated island of the group, is about 38 °F (3 °C), being about 30 °F (−1 °C) in January and about 52 °F (11 °C) in August. The highest and lowest temperatures recorded on the islands are 78 °F (26 °C) and 5 °F (−15 °C) respectively. The average annual rainfall is about 80 inches (2,000 mm), and Unalaska, with about 250 rainy days per year, is said to be one of the rainiest places within the U.S. The growing season lasts approximately 135 days, from early in May until late in September, but agriculture is limited to the raising of few vegetables. With the exception of some stunted willows, the vast majority of the chain is devoid of native trees. On some of the islands, such as Adak and Amaknak, there are a few coniferous trees growing, remnants of the Russian period. While tall trees grow in many cold climates, Aleutian conifers — some estimated to be two hundred years old — rarely reach a height of even 10 feet (3 m), and many of them are still less than 5 feet (1.5 m) tall. This is because the islands, much like the Falklands and other islands of similar latitudes, experience such strong winds that taller trees are vulnerable to snapping off. Instead of trees, the islands are covered with a luxuriant, dense growth of herbage and shrubs, including crowberry, bluejoint, grasses, sedges, and many flowering plants. There are areas of peat bog near the coasts. Endemic plants include the endangered Aleutian shield fern. The Aleutians are home to many large colonies of seabirds. Buldir Island has 21 breeding seabird species, including the Bering Sea-endemic red-legged kittiwake. Large seabird colonies are also present at Kiska, Gareloi, Semisopochnoi, Bogoslof, and others. The islands are also frequented by vagrant Asiatic birds, including the common rosefinch, Siberian rubythroat, bluethroat, lanceolated warbler, and the first North American record of the intermediate egret. The habitats of the Aleutians are largely unspoiled, but wildlife is affected by competition from introduced species such as cattle, caribou, and foxes. Nearly all of the Aleutians are protected as part of the Alaska Maritime National Wildlife Refuge and the Aleutian Islands Wilderness. Observations have identified sea otters as a keystone species along the coasts of many of the Aleutian Islands. Their presence encourages the growth of kelp forests, as the otters control sea urchin populations (as large populations of sea urchins can create urchin barrens by clearing away kelp stands). On the less mountainous islands, the raising of sheep and reindeer was once believed to be practicable. There are bison on islands near Sand Point. Sheep raising seems to have died off with the advent of synthetic fibers, which lowered the value of wool. During the 1980s, there were some llama being raised on Unalaska. The current economy is primarily based on fishing, and the presence of U.S. military. The only crop is potato. Chickens are raised in barns under protection from the cold. In addition to a partial air service and a ferry service, the Alaska Marine Highway passes through many of the U.S. islands. The native people refer to themselves as Unangan, and are now generally known by most non-natives as the "Aleut". The Aleut language is one of the two main branches of the Eskimo–Aleut language family. This family is not known to be related to any others. The 2000 U.S. Census recorded a population of 8,162 on the islands, of whom 4,283 were living in the main settlement of Unalaska. Because of the location of the islands, stretching like a broken bridge from Asia to America, many anthropologists believe they were a route of the first human occupants of the Americas. The earliest known evidence of human occupation in the Americas is much farther south; the early human sites in Alaska have probably been submerged by rising waters during the current interglacial period. People living in the Aleutian Islands developed fine skills in hunting, fishing, and basketry. Hunters made their weapons and watercraft. The baskets are noted for being finely woven with carefully shredded stalks of beach rye. In 1741 the Russian government sent Vitus Bering, a Dane in the service of Russia, and Aleksei Chirikov, a Russian, in the ships Saint Peter and Saint Paul on a voyage of discovery in the Northern Pacific. After the ships were separated by a storm; Chirikov discovered several eastern islands of the Aleutian group, and Bering discovered several of the western islands. Bering was shipwrecked and lost his life in the Komandorski Islands (Commander Islands); one of which now bears his name (Bering Island), along with the surrounding Bering Sea. The survivors of Bering's party reached the Kamchatka Peninsula in a boat constructed from the wreckage of their ship, and reported that the islands were rich in fur-bearing animals. Siberian fur hunters flocked to the Commander Islands and gradually moved eastward across the Aleutian Islands to the mainland. In this manner, Russia gained a foothold on the northwestern coast of North America. The Aleutian Islands consequently belonged to Russia, until that country transferred all its possessions in North America to the U.S. in 1867. During the consolidation of the Russian-American Company there was sporadic conflict with the native population (frequently disastrous to the poorly armed and vastly outnumbered Russians). The colonies soon entered a relatively stable state based on cooperation, intermarriage, and official policies that provided social status, education, and professional training to children of mixed Aleut-Russian birth. Within a generation, the day-to-day administration of the Russian-American colonies was largely in the hands of native-born Alaskans. Reversing the usual trend in colonization where indigenous technologies are replaced, the Russians adopted the Aleut kayak, or baidarka, sea otter hunting techniques, and the working of native copper deposits. The Russians instituted public education, preservation of the Aleut language through transliteration of religious and other texts into Aleut via an adaptation of the Cyrillic alphabet, vaccination of the native population against smallpox, and science-based sea mammal conservation policies that were ahead of their time. During his third and last voyage in 1778, Captain James Cook surveyed the eastern portion of the Aleutian archipelago, accurately determined the position of some of the more important islands, and corrected many errors of former navigators. The principal settlements were on Unalaska Island. The oldest was Iliuliuk (also called Unalaska), settled in 1760–1775, with a customs house and an Orthodox church. After the American purchase of Alaska from Russia in 1867, further development took place. New buildings included a Methodist mission and orphanage, and the headquarters for a considerable fleet of United States revenue cutters, which patrolled the sealing grounds of the Pribilof Islands. The first public school in Unalaska opened in 1883. The U.S. Congress extended American citizenship to all Native Americans (and this law has been held to include the indigenous peoples of Alaska) in 1924. A hospital was built in Unalaska in 1933 by the U.S. Bureau of Indian Affairs. During World War II, in what was the only two invasions of the United States during the war, small parts of the Aleutian islands were occupied by Japanese forces, when Attu and Kiska were invaded in order to divert American forces away from the main Japanese attack at Midway Atoll. The U.S. Navy, having broken the Japanese naval codes, knew that this was just a diversion,[disputed – discuss] and it did not expend large amounts of effort in defending the islands. More than 90 Americans were taken to Japan as prisoners of war. Most of the civilian population (over 800) of the Aleutians and Pribilovians were detained by the United States in camps in the Alaska Panhandle. During the Aleutian Islands Campaign, American forces invaded Japanese-held Attu and defeated the Japanese. American and Canadian troops later launched an invasion of Kiska, but Japanese forces had already withdrawn, ending the campaign in the islands. June 3, 2002 was celebrated as Dutch Harbor Remembrance Day. The governor of Alaska ordered state flags lowered to half-staff to honor the 43 Americans who died during the two-day Japanese air attack in 1942. The Aleutian World War II National Historic Area Visitors Center opened that month. The U.S. conducted underground tests of nuclear weapons on Amchitka Island from 1965 to 1971 as part of the Vela Uniform program. The final detonation, the Cannikin, was the largest underground nuclear explosion by the U.S.
^ a b The Editors of Encyclopædia Britannica (18 December 2015). "Aleutian Islands". Encyclopædia Britannica. Retrieved 6 February 2017. ^ "Aleutian Islands". Merriam-Webster. Merriam-Webster, Inc. Retrieved 14 February 2016. ^ Mark Nuttall, ed. (2005). Encyclopedia of the Arctic. Routledge. p. 333. ISBN 0-203-99785-9. ^ George Forchhammer (1863). Royal Society of London (ed.). "On the Constitution of Sea-Water, at different Depths, and in different Latitudes". Proceedings of the Royal Society of London. Taylor & Francis. 12: 131. ^ Klemperer, S. L.; Miller, E. L.; Grantz, A.; Scholl, D. W. (2002). "Crustal structure of the Bering and Chukchi shelves: Deep seismic reflection profiles across the North American continent between Alaska and Russia" (PDF). Special Papers, Geological Society of America. 360: 1–24. ISBN 9780813723600. Retrieved 30 July 2018. ^ Holbrook, W. S.; Lizarralde, D.; McGeary, S.; Bangs, N.; Diebold, J. (1999). "Structure and composition of the Aleutian island arc and implications for continental crustal growth" (PDF). Geology. 27 (1): 31–34. doi:10.1130/0091-7613(1999)027<0031:SACOTA>2.3.CO;2. Retrieved 30 July 2018. ^ a b c d e f g h i j k One or more of the preceding sentences incorporates text from a publication now in the public domain: Chisholm, Hugh, ed. (1911). "Aleutian Islands" . Encyclopædia Britannica. 1 (11th ed.). Cambridge University Press. pp. 543–544. ^ "Alaska volcano erupts again, sending up another ash cloud". Fox News. 2017-01-26. Retrieved 2017-01-27. ^ "Aleutian Islands". Terrestrial Ecoregions. World Wildlife Fund. ^ Estes, James (2016). Serendipity: An Ecologist's Quest to Understand Nature. University of California Press. ISBN 978-0520285033. Morgan, Lael (September 1983). "The Aleutians: Alaska's Far-out Islands". National Geographic. Vol. 164 no. 3. pp. 336–363. ISSN 0027-9358. OCLC 643483454. Wikivoyage has a travel guide for Aleutian Islands. Wikimedia Commons has media related to Aleutian Islands.